This photo of painted hearts was taken at an old store. It was a lovely sunny winter day with a promise of spring. The kind where you for the first time can feel the sun actually warming your face. I had time in my hands, so I walked into this store to have a look what they had to offer. 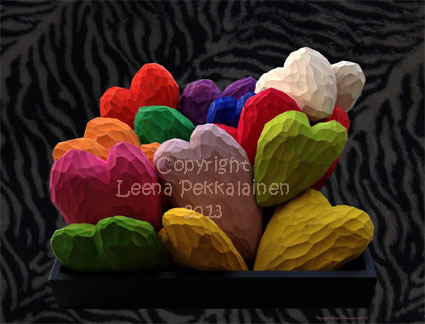 By the window was a wooden tray full of these endearing color hearts. I looked at them more closely and realized they were made of wood. Carefully carved by someone, leaving them looking a bit crude, and then painted with the most delightful colors. They were simply adorable. And again they made me think what they might symbolize. Can you guess? Well us, of course. People, with all their differences and beliefs and values. All different, all unique - and yet, all the same. They all share the same basic shape, even if the details are different in each and every one. And all of these color hearts were just as valuable and lovable as the next one. People would pick them, one by one according to their own preferences, until the tray was empty. Maybe someone would take a heart they did not quite think was the right color, if the color they wanted was not there. And maybe they realized later the heart they chose was just the perfect one. Imagine these hearts are the people around you. Value each individually, give them permission to be who they are, and you will realize the world is a much more interesting place because of our differences. And just like these hearts - despite the differences they all fit in the same box. Now there's a lesson there somewhere, don't you think? Click to sign up and receive Leena Maria's new books for free! CLICK HERE OR ON THE BOOK COVER, TO ORDER THE BOOK ON AMAZON. This is the book I originally wrote as my NaNoWriMo project in November 2016, A mixture of witches, spells, ancient Egypt and afterlife – with a dystopian sprinkle. Always wondered how mummification ws done? Wonder no more - Mr Mummific reaveals the whole process in this book. click on it and you can do so. If you wish to send this photo as a postcard or put it on your wall as a print, you are more than welcome to do so. Photographs are copyrighted by their photographers. No reproduction permitted without a written permission. By Leena Pekkalainen © Copyright 2008-2016 Photographs are copyrighted by their photographers. Artwork is copyrighted by the artist. Articles are copyrighted by their writer. No reproduction is permitted without written consent of the site owner. This site is supported through affiliate marketing. A small commission is earned from purchases which funds site research and upkeep.